In December 1754 the trustees of the Academy of Philadelphia appointed a committee to inquire into the possibility of hiring German-born Johann Matthias Kramer/Cramer as professor of French and German languages. The following month the committee reported that Mr. Kramer was qualified to teach the languages of French, German, and also Italian. Kramer had the added advantage of being skilled in music and painting. Kramer’s request to teach part-time, with the option of using Academy facilities for teaching private students, was denied by the trustees in favor of hiring him as a full-time faculty member. 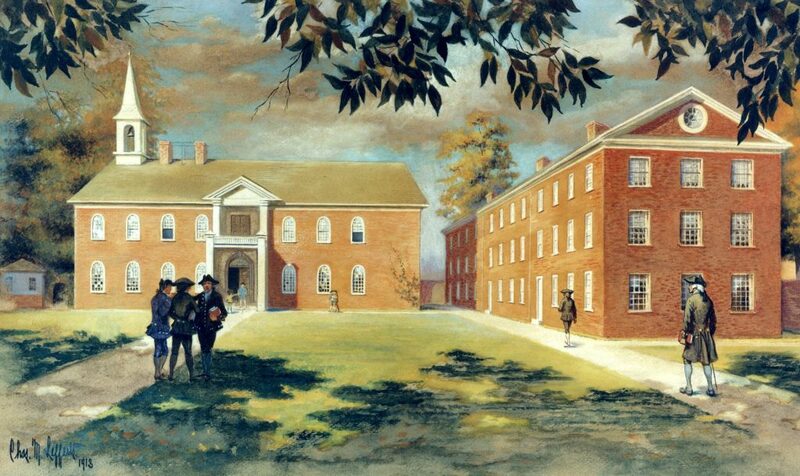 In May of 1755, the Trustees found no further use for Kramer’s services. They maintained this position at their July meeting, even after Kramer wrote them requesting one more year of employment. Johann Matthias Kramer was born in Nuremberg, Germany. His father, Mathias Kramer/Cramer (1640-1729), was a famous German linguist who produced one of the first books in German on the Italian language. Johann followed in his father’s footsteps as a linguist. He attended the University of Göttingen and later served as an instructor of Italian there from 1746 to 1753. Prior to his university work, Kramer served as the secretary to Moravian leaders Nikolaus Ludwig, Count von Zinzendorf, and Pufendorf and published a pamphlet on Georgia and the “New World” in 1746. Nothing more is known of Kramer after his brief time in Philadelphia in the 1750s.